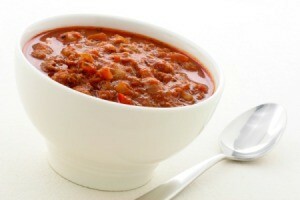 Traditionally chili is made with meat and beans, however, sometimes you may want to leave the beans out. This page contains chili recipes without beans. So simple to make but it is so good. Seasoning Mix: In a bowl combine all of the seasoning mix. Stir well to make sure it is blended well. Brown off 1/2 of the ground beef. Pour browned off beef into a 4 qt. pot. Brown off the other 1/2 of the ground beef. Pour browned off beef into pot. Brown off 1/2 lb of the ground chuck. Pour browned off chuck into pot. Give pot a quick stir to begin blending the beef and chuck. Continue browning the ground chuck, 1/2 lb at a time. Give the pot a quick stir after each batch is added. Note: Do NOT use any tomato paste! Tips: Add some melted Velveeta cheese for a great chip dip! I browned the meat off in small batches as it was easier for me to do so. You can brown all the meat at once if you have a large enough pan. Source: I created this in my own kitchen. Heat oil in 4 quart heavy kettle. Add beef and stir frequently until meat changes color but not browned. Lower heat and add garlic. Combine chili powder, cumin and flour. Sprinkle over meat. Stir; then crumble oregano over meat. Add 1 1/2 cans broth. Add salt and pepper. Bring to a boil, stirring occasionally. Reduce heat, simmer partly covered for 1 1 /2 hours, stirring occasionally. Add rest of broth and can of chili; simmer another 30 minutes. Refrigerate overnight. Must follow recipe exactly or it is not the same dish. Serve with flour tortillas, sour cream, lime and pinto beans on the side, if desired. Heat oil in large cast iron skillet. Add onions and jalapeno pepper and cook until the onion is transparent. Add chili powder, masa harina, paprika, cumin powder, oregano and cayenne pepper. Stir until seasonings are slightly toasted. Stir in garlic, brown sugar, mustard, tomato sauce, water, beer, and tomato paste. Cook over medium heat for 15 to 20 minutes, stirring often. Then cover and simmer over medium-low heat for 30 minutes to help combine the flavors. Serve with tortillas, on French bread or as a taco filling. (Optional) Top with sour cream, tomatoes, lettuce, and salsa. Does anyone have a good no bean chili recipe that's spicy but not ridiculously spicy to where you can't eat it? Cook beef, bell pepper, onions and garlic in oil in a large heavy pan until beef is lightly browned. This is the chili I make every winter. Brown ground chuck and drain. Cook macaroni in mixture of tomato juice and water; drain. Add everything else into pot and simmer all day. Very spicy but not over bearing. ENJOY!